In the past several years, many so called “Cajun” restaurant have popped up all over the world. Not only are these facilities NOT Cajun, but they have managed to ruin the reputation of good Cajun cooking. They seem to think that all you need is a bottle of cayenne pepper, and this “magically” turns it into “Cajun” food. I recently received an e-mail message from someone that was from Louisiana, but used to live outside of Louisiana. I’ll quote his remarks because I can’t say it any better; “I was most pleased to see that you made a statement on the bogusness of some ‘Cajun’ restaurants and dishes served in various places. I hear people all the time saying that Cajun food is ‘too hot’, to which I always reply, “well, they screwed it up then’ “. How true it is !!! The unfortunate myth about Louisiana cooking is that it has to be hot or it’s not “Cajun.” This simply is not true! 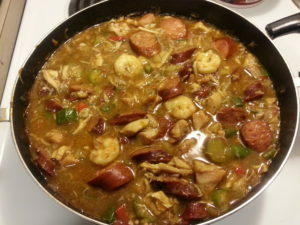 The true art of Louisiana seasonings is in the unique blend of herbs and spices that serve to enhance the flavor of vegetables, seafood, meats, poultry and wild game, along with a “Cajun” cook that knows how to blend these spices. The seasonings offered here are already mixed and blended and ready for your use.